How Do Bubbling Rocks Work? 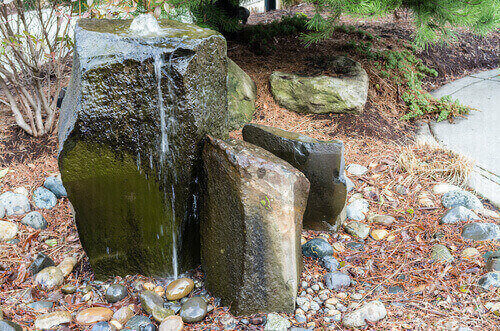 Home > Blog > Water Features > How Do Bubbling Rocks Work? Bubbling rocks can be the perfect addition to your pond or water garden. Not only is bubbling water pleasing to the eye, but the sound is soothing and relaxing to hear. But what is a bubbling rock? How does it work? Below is an explanation of how bubbling rocks work along with how and why you should consider installing them. A bubbling rock is a type of boulder or stone that is embedded within a water garden and which emits water from the top, which flows down the sides. It is comprised of three parts, which are the pump kit, basin and rock. The rocks used for these systems must have a specific formation or composition. Many rocks and boulders are prone to breakage or chipping when drilling is applied so they are not good candidates. The best rocks are rubble or granite boulders. The shape of the rock will determine the manner in which the water cascades, but rock drilling should only be left to pros as the process can be hazardous. The pump kit is responsible for moving water through the rock. Some of the accessories which come in a standard kit include valves, fittings, clamps and hoses. The basin is a type of reservoir which will be positioned beneath the bubbling rock. It could be something as simple as a hole which is dug into the yard and then lined with heavy duty plastic or a pond liner. Moving water is a necessity for ponds and water gardens. Water which sits still will deteriorate and become a breeding ground for mosquitoes especially in tropical and subtropical climates. Bubbling rocks keep water circulating and can be installed within small areas, which is advantageous for people who have smaller yards. They can also be used both indoors and outdoors, which make them viable even for people who live in apartments or urban environments. Perhaps the biggest advantage of bubbling rocks is that they are low in cost and maintenance. Once you have the pump kit, basin and rock, you will next need to identify a viable location and prep it for installation. Within buildings they can be installed near the surface level and outdoors they can be installed in a patio. Stone and plants can be used to conceal the basin. You should also pay attention to the splash radius particularly if the bubbling rock is being installed indoors. Many pond owners choose to bury the basin. To do this, you will need to find a spot and then excavate it. It should have the same depth and size of the basin. The soil at the bottom of the hole must be tamped to provide a strong base. You can then add a layer of sand (C-10 is best) to act as the leveling base. The basin can then be placed in hole and the soil can be used to anchor it in place. After this you would install both the bubbling rock and the pump kit.